The annual tradition celebrates St. Patrick's Day and Irish-U.S. relations. Irish Prime Minister Leo Varadkar met with President Donald Trump Thursday before heading to Capitol Hill to take part in the annual Washington tradition of celebrating St. Patrick’s Day and the relationship between the U.S. and Ireland. Varadkar's visit comes as the United Kingdom is embroiled in chaos over Brexit and Ireland's concerns over its border and potential trade problems with Northern Ireland. 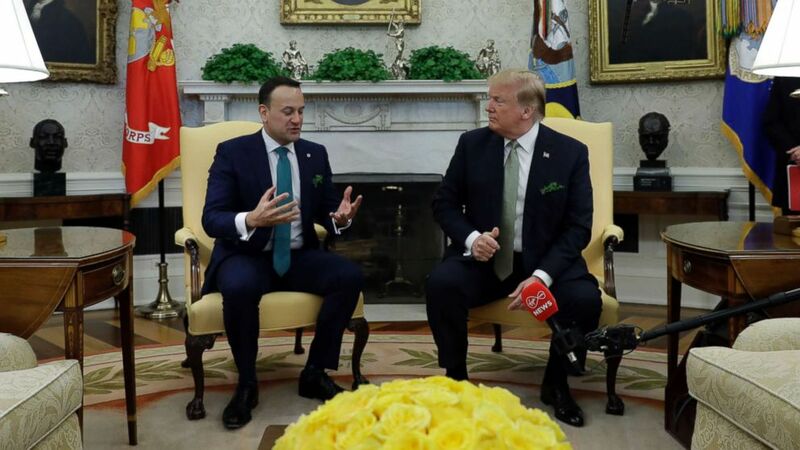 During his talks at the White House, the Taoiseach (Gaelic for "leader") spoke with Trump, wearing a green tie and sporting shamrocks in his coat pocket, about Ireland’s position opposing Brexit and the current imbroglio. (Evan Vucci/AP) President Donald Trump meets with Irish Prime Minister Leo Varadkar in the Oval Office of the White House, March 14, 2019. "As you know, he's in a very complicated position right now because of Brexit, you're going to have to tell me what's happening, and tell the world what's happening because I'm not sure anyone knows," Trump told Varadkar, before criticizing Prime Minister Theresa May's leadership on the recent vote to salvage a Brexit deal that she lost by a landslide. "I'm surprised at how badly it has all gone from the standpoint of the negotiation. But I gave the prime minister my ideas how to negotiate it. I think you would have been successful," Trump said. "She didn't listen to that and that's fine. She has to do what she has to do." 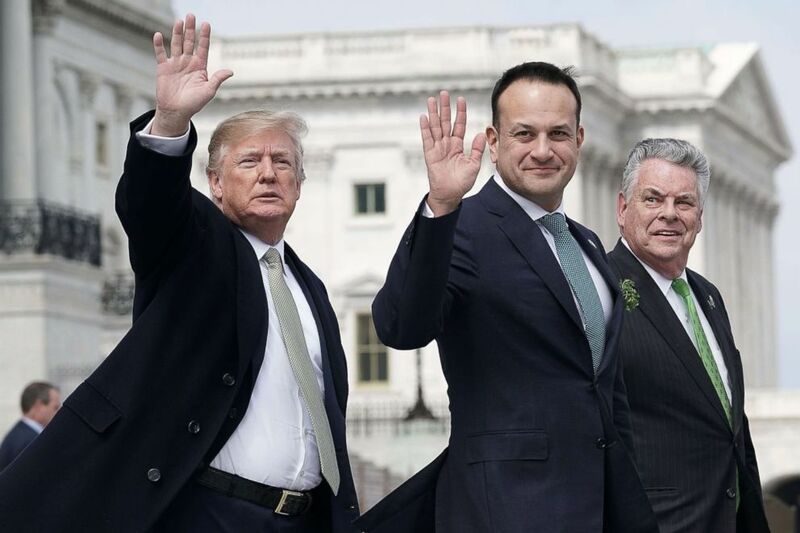 (Alex Wong/Getty Images) President Donald Trump and Irish Prime Minister Leo Varadkar wave as U.S. Rep. Peter King (R-NY) (R) looks on after the Friends of Ireland luncheon March 15, 2018, on Capitol Hill. The president added that the two leaders were discussing trade with the European Union, as well as Trump's threatened tariffs. "We’re talking about trade with the European Union. They’ve been very, very tough over the years," Trump said. "If they don’t talk to us, we’re going to do something that’s going to be pretty severe economically. We’re going to tariff a lot of their products." The Irish prime minister’s annual trip to Washington involves a visit to the U.S. Capitol for a special Friends of Ireland luncheon attended by the president, vice president, House speaker, the Taoiseach, and members of Congress. House Speaker Nancy Pelosi greeted the president and the Taoiseach of Ireland on the steps of the Capitol and then at the luncheon toasted the annual event as a tradition where "we dispense with our differences" to celebrate the strong U.S.-Irish bonds. She ticked through some historical giants who’ve participated in past celebrations and offered what seemed like a subtle jab at Trump's immigration policies by reminding the audience that Reagan once declared "if we shut the door to new Americans, our leadership will soon be lost." The president, who faces the potential public rebuke of his national emergency declaration in the Senate, stuck to the script in his brief remarks. "The U.S. and Ireland tied together by both ties of kinship and friendship," he said. "Today, our relationship is as strong and resilient as the great Irish people are strong and resilient." "May we all be blessed with the luck of the Irish," the president said. 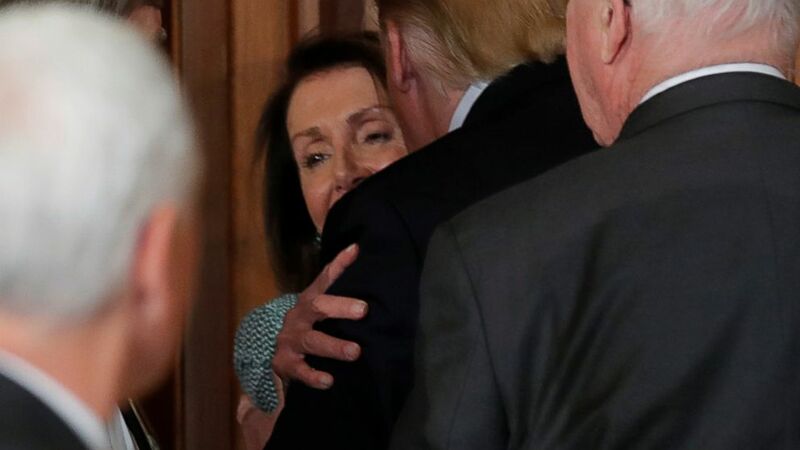 After their display of smiles and kind comments, Trump kissed Pelosi on both checks as he left the lectern. (Jim Young/Reuters) Speaker of the House Nancy Pelosi is hugged and kissed by President Donald Trump at the 37th annual Friends of Ireland luncheon at the U.S. Capitol in Washington, March 14, 2019. The Taoiseach presented Pelosi with a historical, framed copy of a message of support of Ireland’s new constitution sent from the U.S. in 1937, signed by 300 American lawmakers. Thursday morning, Vice President Mike Pence welcomed the Taoiseach to his residence in northwest Washington for breakfast. The Taoiseach, the first of Indian-descent, and the first openly gay leader of Ireland, brought his partner Matthew Barrett to visit with the Vice President, who is known for his conservative views on homosexuality. Varadkar touched on his sexual orientation when speaking at the Naval Observatory. "I stand here, leader of my country, flawed and human, but judged by my political actions, and not by my sexual orientation, my skin tone, gender or religious beliefs." "We are all God's children," Varadkar added. Both President Trump and Vice President Pence said they accepted invitations to visit Ireland at some point this year. Last year, Trump was scheduled to visit Ireland either before or after his trip to Paris. The Ireland leg of his trip was canceled. Later Thursday at the White House, the Taoiseach will present the president and first lady with a crystal bowl filled with shamrocks.